I trust that all of you are comfortably accommodated and I am sure that the Cauvery Lodge is taking good care of you. It is always a pleasure to get together at our District Grand Lodge meetings and these gatherings are made more special when there is a major event, such as a centenary to be celebrated. I warmly welcome R.W.Bro. Abraham Markos, The Regional Grand Master of The Regional Grand Lodge of Southern India and his team of officers. No stranger to us, R.W.Bro. Markos is a member of our District but is, however, visiting us for the first time as the Regional Grand Master for Southern India. Welcome R.W. Bro. Markos and please join us at the banquet after the meeting. I extend an equally warm welcome to W.Bro. Ganeindran Sinnathamby, Asst. District Grand Master of the District Grand Lodge of Eastern Archipelago who is visiting us from Kuala Lumpur. I invite you and your officers to join us at the festive board after the meeting. Also a warm welcome to V.W.Bro. Pichumani Venkatraman, PGSwdB, Deputy District Grand Master, who is here representing R.W.Bro. Percy Driver, District Grand Master of the District Grand Lodge of Bombay. At the Annual Investiture meeting of Grand Lodge V.W.Bro. Dr. David Staples took charge as the Grand Secretary. We have sent him a message offering our congratulations and wishing him success. In commemoration of the completion of 50 years as Grand Master, a bronze bust of the Grand Master, sculpted by Frances Segalmann, has been put on display in the Kent Room of Freemasons Hall in London. A few months ago an article, derogatory to Freemasonry, was published in The Guardian newspaper in the UK. The Grand Lodge, supported by the various Provincial Grand Lodges, responded very strongly by taking out full page advertisements in the major daily newspapers in the UK and by holding meetings with the press and the public in various provinces. The entire campaign was most successful as is evidenced by the greatly increased interest in the UGLE website. The Grand Lodge has encouraged all District Provinces to establish more contact with the press and the public and to educate them on the benefits of Freemasonry so that such disreputable articles about Freemasonry are not published. In recent times Freemasonry has been faced with a new challenge that of gender reassignment. The Grand Lodge has done a lot of work on this issue and now have come up with clear guidelines or rules on this subject. These have been circulated to all the Lodges and I strongly recommend that every single member of our District makes himself familiar with these rules as the subject of gender reassignment can be extremely sensitive and the last thing that any Lodge needs is for any of its members to be treated insensitively. The District Grand Lodge continues to function well and our finances are sound. The rental of Cornwallis Home has given us a steady stream of income to continue our charitable activities and the District Grand Charity has been busy in identifying and catering to the needs of those in distress. Since we last met I had the honour of presenting the 50 year lapel pin and citation to W.Bro. Gopal Madhavan and my illustrious predecessor R.W.Bro. K.R.N. Menon both at meetings of the Archibald Campbell Lodge. I would like to congratulate both of them, once again, and thank them for the service they have rendered to Freemasonry and for the wonderful celebrations we had at these meetings. Brethren, I am very happy to inform you that our District Grand Mentor and our District Grand Orator have been extremely busy visiting various lodges and conducting various programmes. The programmes being conducted are of great interest are an education in themselves. I would request the Worshipful Masters of all Lodges to please take advantage of their dedication and further spread Masonic knowledge throughout the District. I am sure you will all agree to what I have said after having seen the performance we had this morning. My congratulations to W.Bro. M.S. Duleep who was awarded with the grand rank at the Annual Investiture meeting in London in April this year. The records of these Lodges were inspected by W.Bro. Sunil Koliyot and W.Bro. T.P. George respectively. Brethren, please be upstanding to observe a minute’s silence in their memory. Brethren, our collective thanks are due to W.Bro. Ilango Raphael, District Grand Secretary, W.Bro. Viji Joseph, District Grand Treasurer, and W.Bro. P.B. Shankar and the entire team at the DGL Office for all that they have done to ensure the smooth functioning of the office and the general administration of the District. Our thanks are also due to W.Bro. Sukesh Menon, President, District Grand Charity, W.Bro. Sunil Koliyot, District Grand Director of Ceremonies and V.W.Bro. S. Sampath, President of the Board of General Purposes, and Chairman of the Premises Committee, where he has been actively ensuring that the Madras Freemasons Hall Trust is managed well. Until we meet under the banner of Lodge Faith Hope & Charity in February, 2019, Brethren, I wish you God Speed. Good evening and welcome to Hyderabad. It is gratifying to see that so many Masons have made an effort to be with us this evening in the Northern most part of our District. It is always a pleasure to have our distinguished visitors with us, all of whom have travelled considerable distances to be here. I extend a warm welcome to R.W.Bro. Kallakuri Lakshmi Narasimha Rao who is here representing R.W.Bro. Abraham Markos, the Regional Grand Master of the Regional Grand Lodge of Southern India together with his officers to all of whom I extend an invitation to join us at the banquet following this meeting. It is a pleasure to have with us R.W.Bro. V. Nagarajan, District Grand Master of the District Grand Lodge of Northern India who also happens to be a member of the Golconda Lodge and is, therefore, wearing two hats this evening. I welcome W.Bro. Ferhad Nilgeria, Deputy District Grand Master of the District Grand Lodge of Sri Lanka, who represents his District Grand Master and representing R.W.Bro. Dato Jeyaraj Ratnaswamy, District Grand Master of the District Grand Lodge of the Eastern Archipelago is W.Bro. Ganeindran Sinnathamby, Assistant District Grand Master, who is no stranger to us having attended a few of our meetings in the past. Bro. Ganeindran, it is indeed a pleasure to have you and your team of officers with us this evening and while extending all of you a warm welcome I also invite you to join us at the banquet following the meeting. Brethren, the Tercentenary celebrations of our Grand Lodge culminated on October 31, 2017 with over 4,000 masons gathered at London’s Royal Albert Hall to witness a most impressive theatrical performance outlining the history of the United Grand Lodge of England and featuring prominent Masons through the last three centuries. As distinguished visitors to the event we had more than 130 Grand Masters from Grand Lodges all over the world. As you know we had a very limited number of seats available at the celebration and I was very pleased to see that all our allocated seats were taken. I am sure that those Brethren, amongst you, who attended this event, not only enjoyed it but will remember it for many years to come. Following the event at the Royal Albert Hall, about 2,000 of those who attended dined at a fabulous banquet at Battersea Evaluation. A complete recording of the event at the Royal Albert Hall is still available online and any of you who wish to view it may obtain the link from the District Grand Secretary. Brethren, some of you have probably heard of the data protection statutes in the UK. Under these statutes the personal data of all of us, which is in the records of the Grand Lodge, needs to be adequately protected by the Grand Lodge. In order to do this we have had to sign a data sharing agreement with the Grand Lodge under which we share the data of our members with the Grand Lodge. The Grand Lodge cannot, however, share our personal data with anyone unless we have given them our individual consent. Individual consent is given for the Grand Lodge to share our personal data with the Masonic Charitable Foundation and other Masonic charities only. Since the year 2005 the consent of an individual Mason for the Grand Lodge to share his data with Masonic charities, has been incorporated in the Registration Form A. Those of us who became Masons prior to 2005 and who have not joined a Lodge after 2005 should have received e-mail messages from the Grand Lodge requesting our consent for them to share our data with the Masonic charities. Brethren, your consent is not mandatory and it is entirely left to you as to whether you wish to give it or not. In any event you must please respond to the Grand Lodge communicating your decision. If any of you, who fall under this category, have not received the e-mail from Grand Lodge please contact the DGL office who will guide you in this matter. The foregoing is covered in a Circular from the DGL Office which was sent on January 11, 2018. Brethren, I am pleased to report that the District continues to be in good shape with great contribution from our 1,100 dedicated brethren and I thank all of you for the support you always given to the District which has made it a vibrant centre of Freemasonry. Brethren, there is one matter which I need to bring to the attention of all of you. Over the last two or three years some Brethren have started canvassing for ranks, either for themselves or for friends. This canvassing has gone to the extent of requesting members of other Districts or Constitutions, who happen to be friends of mine, to call me and recommend ranks for Bro. A, B or C. Brethren, in my mind this is a very unmasonic practice and I request you to kindly refrain from indulging it as it can only damage our District and our brotherhood in the long term. You would have seen that our customary mentoring meeting was not held during this DGL week end. The reason for this was that our District Grand Mentor W.Bro. M.S. Duleep together with a few other Brethren, organized an excellent and very well attended mentors’ meeting under the banner of The Lodge of Faith Hope & Charity, in Ooty, in December last year. The meeting was attended by about 100 brethren from various Lodges throughout the District and the content, prepared by W.Bro. Duleep, was extremely educative and helpful in outlining a course of action for each Lodge to recruit, retain, and retrieve members. Brethren, our District Grand Mentor, Wor.Bro. Duleep, and our District Grand Orator W.B. A.K. Nair, have made tremendous efforts to visit various Lodges and provide the sort of education and guidance that their offices require them to provide. My sincere thanks to both of them for their very sincere efforts. As is customary during any major Masonic event, the Grand Lodge provided our District with two celebratory grand ranks during the Tercentenary year. Brethren, I am very pleased to inform you that these celebratory grand ranks have been earned by W.Bro. Praveen Khanna and W.Bro. Sunil Koliyot, for their services to our District and to our fraternity. Bro. Sunil and Praveen, I offer you my personal congratulations on your preferment and I sincerely hope that these honours will encourage you to continue to serve the fraternity. Brethren, my personal congratulations to all of you who have been invested with active and brevet ranks this evening. Let me once again remind you that these ranks are not only given to you for past services but are meant to encourage you to continue in the faithful discharge of your duties. Brethren, I would like to say a word of special thanks to W.Bro. S. Sampath who, unhesitatingly, stepped in to support the District, following the untimely death of W.Bro. V.J. Bharath, by accepting the office of President of the Board of General Purposes. V.W.Bro. Sampath, thank you very much for your support. Our District runs well because of the efforts made by those Brethren appointed to administer, the chief office being that of the District Grand Secretary. Brethren, we should all give our very sincere thanks to W.Bro. Selvaraj Ponnaiya who has been a pillar of support for me and for the District and who has this evening laid down that office. Thank you very much W.Bro. Ponnaiya for all the work that you have put in during your years as District Grand Secretary and I look forward to continuing to work with you in the running of our District. We now welcome W.Bro. Ilango Raphael who has this evening assumed the office of District Grand Secretary. Brethren, my sincere thanks to our District Grand Treasurer W.Bro. Viji Joseph, the President of the District Grand Charity, W.Bro. Sukesh Menon, our District Grand Director of Ceremonies, W.Bro. Sunil Koliyot, all of whom have given of their time and efforts in order to ensure that our District and our charities are well administered. I must also thank W.Bro. P.B. Shanker and his team at the DGL Office who work very hard in keeping the District healthy and ensure that all of us can enjoy events such as this one. I had the pleasure of attending the Installation meeting of Lodge Anchor of Hope No.1093 on 14.02.2018. The records of the Lodge were inspected by Wor.Bro. Sunil Koliyot. Lodge of Universal Charity No.273 on 15.12.2017 St. John’s Lodge No.434 on 27.12.2017 Lodge of Rock on 6th January, 2018 Pitt Macdonald Lodge on 9th January, 2018 And Lodge of Perfect Unanimity on 12th January, 2018. The records of the Archibald Campbell Lodge No.4998were inspected by W.Bro. Sunil Koliyot and those of Universal Charity by W.Bro. K.M. Sukumaran. Brethren, on 9th September, 2017 our distinguished Bro. V.J. Bharath, Past Jr. Grand Deacon was summoned to the Grand Lodge above. As you all know he had, for many years, served our District in various offices and was always willing to take on any work that the District required him to do. With over 40 years as a Mason, he was, at the time of his death, the President of Board of General Purposes. On 30.01.2018 Bro. Madhavan Koliyot of The Lodge of Universal Charity and Bro.T.R.Natarajan of the Lodge of Rock on 15.2.2018 were called to the Grand Lodge above. I request you all to please rise and observe a minutes silence in their memory. Brethren last but not least I think that we should all say a very big thank you to the Master and Brethren of the Golconda Lodge who have worked very hard in arranging this Masonic week end. I understand that W.Bro. Capt. Hemanth Reddy who is the immediate Past Master of Lodge Golconda has been most involved in all the arrangements that have been made for this meeting. Brethren, I think that a special word of thanks is due to W.Bro. Hemanth Reddy. Good morning Companions and welcome to Hyderabad. I am sure that the Golconda Lodge and its Chapter have you all well accommodated and cared for. I would like to take this opportunity to thank the Wor. Master and Brethren of the Golconda Lodge and the Companions of its Chapter for all that they have done to ensure our comfort. It is with great pleasure that I would like to welcome our distinguished visitors some of whom have travelled long distances to spend this week end with us. E. Comp. Kallakuri Lakshmi Narasimha Rao who represents E.Comp. Abraham Markos, Grand Superintendent of the Regional Grand Chapter of Southern India, and his officers, E.Comp. V. Nagarajan, Grand Superintendent of District Grand Chapter of Northern India and his officers, E.Comp. Ferhad Nilgeria, who represents E.Comp. Malin Goonetileke, Grand Superintendent of the District Grand Chapter of Sri Lanka and his officers, E.Comp. Ganeindran Sinnathamby, Past Dist. Deputy Grand Director of Ceremonies who is here representing E.Comp. Dato Jeyaraj Ratnaswamy, Grand Superintendent of the District Grand Chapter of the Eastern Archipelago and his officers. Companions, thank you all for taking the time to be with us on this occasion. I trust that you are all comfortably accommodated. Companions, our M.E. Grand Superintendent M.E.Comp. His Royal Highness Duke of Kent has completed 50 years of service to Royal Arch Masonry and while thanking those Companions who had sent him messages of congratulations he said, “Although smaller than the Craft, there is no doubt that the Royal Arch holds a very warm and special place in our affections. Over the last fifty years we have adapted our ritual to make it easier to understand, to remove some of the anomalies and to ensure a greater involvement from the Companions, and I am very pleased to see the progress that has been made”. Companions, I sincerely hope that the changes which have been made, over the past several years, will have the desired effect in our District by encouraging larger numbers of Master Masons to join the Royal Arch. I am very pleased to announce that the tercentenary celebratory grand rank for our District has been given to E.Comp. Sukesh Menon who has been awarded the rank of Past Asst. Grand Director of ceremonies. E.Comp. Sukesh Menon, please accept my congratulations. As far as our District is concerned it continues to be well managed and, I am very pleased to report, that the total number of Royal Arch Masons in the District continues to increase albeit slowly. I once again request every private Chapter to appoint a Royal Arch representative in the Craft Lodge to which it is attached, whose main function should be to recruit every new made Master Mason. Companions, E.Comp. Selvaraj Ponnaiya, in his capacity as District Grand Scribe Ezra has put in an enormous amount of work in administering the District and in supporting me in all my endeavours. He has now laid down office and I would, on behalf of all members of the Royal Arch, like to say a big thank you to him for his dedication and hard work. I would like to wish E.Comp. Ilango Raphael every success in his new position as District Grand Scribe Ezra. Companions, I would like to congratulate all those who received ranks or promotions this morning and I sincerely hope that these appointments will encourage them to greater involvement in Royal Arch Masonry in our District. I would like to say a special welcome to E.Comp. Mathew Joseph, who has taken over as President of the Committee of General Purposes and I am sure that the affairs of our Chapter are in good hands. Companions, I am extremely sad to inform you that since we last met E.Comp. Vaigalathur Jayaraman Bharath, PAGDC, Past Dist II Grand Principal and member of RA Chapter School of Plato No.150 and E.Comp. Madhavan Koliyot of Chapter Universal Charity have been called to the Grand Lodge above. I request you all to stand and observe a minute’s silence in their memory. Before I close I would like to thank E.Comp. Ponnaiya, E.Comp. Viji Joseph, District Grand Treasurer, E.Comp. A.K. Nair, our outgoing III Principal, E.Comp. Sunil Koliyot, our District Grand Director of Ceremonies, E.Comp. P.B. Shanker and the staff of District Grand Chapter office for their hard work and dedication in taking care of the administration of the District. Thank you Companions and see you this evening. Good evening. It is indeed wonderful to see a gathering this large to suitably conclude our District’s celebration of the Tercentenary of the Grand Lodge in one of the oldest Masonic centers outside the British Isles. Brethren it is an honour for all of us and our District to have with us this evening R.W.Bro. Sir David Hugh Wootton, R.W. Assistant Grand Master of the United Grand Lodge of England. I thank you R.W.Bro. for having travelled all the way from South America to be with us over this week-end. I sincerely hope that you are comfortable in your accommodation and are enjoying this celebration. I would also like to welcome R.W. Bro. Oliver Lodge, Grand Director of Ceremonies, who is no stranger to us. Brethren, the Regional Grand Master R.W.Bro. Abraham Markos has personally conveyed his apologies for his inability to be with us today, as he has other commitments. As most of you know it was just two weeks ago that he was installed as Regional Grand Master and I request you R.W.Bro.Gupta to please convey our congratulations to him. R.W.Bro. Markos is not only a member and initiate of Lodge Cochin No.4359 but also a Past District Grand Officer in our District. It is indeed a pleasure to receive W.Bro. Sankar Lall Banerjee,P A G St B, Deputy District Grand Master of the District Grand Lodge of Bengal who is here representing his District Grand Master R.W.Bro. K.S. David. Welcome to you Bro. Sankar Lall Banerjee and thank you for travelling all the way from Calcutta to be with us at this meeting. I am also pleased to welcome W.Bro. Geneindran Sinnathamby, Assistant District Grand Master of the District Grand Lodge of the Eastern Archipelago who is here representing his District Grand Master and has travelled all the way from Ipoh. I welcome R.W.Bro. Ramesh Jagtiani, P.Dy. G.M. P.Dy. R.G.M., representative of the Regional Grand Master of the Regional Grand Lodge of Southern India and his team of officers. We also have amongst us R.W.Bro. V. Nagarajan, District Grand Master, District Grand Lodge of Northern India, R.W.Bro. Dato Jeyaraj Ratnaswamy, District Grand Master of District Grand Lodge of Eastern Archipelago, V.W.Bro. Pichumani Venkataraman, Dy. District Grand Master, District Grand Lodge of Bombay, V.W.Bro. Ferhard Nilgiria, Dy. District Grand Master, District Grand Lodge of Sri Lanka, W.Bro. Nicolas Raymond Gras, Asst. Provincial Grand Master of Surrey and W.Bro. P.R. Jackson from the District Grand Lodge of South Island, New Zealand, all of whom are here representing their respective District Grand Masters to all of whom I extend a very warm welcome. I trust that the 18 Brethren selected from our District to attend the meeting will all attend and I am sure enjoy the celebrations. This meeting concludes the celebration in our District and I must say a special word of thanks to R.W.Bro. K.R.N. Menon and the team he selected to assist him in planning and co-ordinating the various activities over this week-end. Brethren our District continues to be vibrant and very active. Our administration is in good hands and our finances are sound. I must convey our sincere thanks to the District Grand Secretary, W.Bro. Ponnaiya and Dist. Grand Treasurer W.Bro. Viji Joseph who have ensured that our administration continues to run very smoothfully. I would also like to thank W.Bro. V.J. Bharath, President of the Board of General Purposes, W.Bro. Sukesh Menon, President, District Grand Charity, W.Bro. Sunil Koliyot, Dist. Grand Director of Ceremonies, who have all given their unstinted support in the management of District. Our sincere thanks also to W.Bro. P.B. Shanker, the Assistant District Grand Secretary and his team at the DGL Office. The mentoring activities of the District are competently handled by W.Bro. M.S. Duleep who together with District Grand Orator W.Bro. A.K. Nair, are making a tremendous effort to educate and mentor our younger brethren. In our 18 Lodges we have approximately 1100 members but we are facing a bit of a problem in Kerala where the strength of our Lodges is approaching or exceeds 100 members which means that a new initiate would take anywhere between15 and 25 years to reach the Eastern Chair. I would like to request R.W. Assistant Grand Master to please bring this to the notice of Grand Lodge with a request they work out some way by which the District of Madras can get at least two more Lodges. Brethren, I have much pleasure in placing on record the fact that W.Bro.S.L. Chitale, PJGD of the Archibald Campbell No.4998 completed 50 years of unbroken service to Masonry in January this year. I had the pleasure of presenting him the 50 Year citation and lapel pin at an emergency meeting of the Archibald Campbell Lodge on the 4th of March. I attended the installation meeting of Lodge of Faith Hope & Charity No.1285 on the 11th March, 2017. The records of the Lodge were kindly inspected by W.Bro. Sunil Koliyot. I thank them for representing me and for inspecting the records of those Lodges. I request you to please be upstanding to observe a minutes silence in their memory. Brethren, I once again take this opportunity to thank all our visitors for having taken the time and trouble to travel great distances to join our celebration and I extend a warm invitation to all of them to join us at the festive board after this meeting. Brethren, before I conclude I would like to thank the W.Master, Wardens, and Brethren of Lodge St. George who have made tremendous effort to organize our get-together this week-end and we all know that they have worked really hard. I would like to express our collective gratitude to the W.Master, Wardens and all the Brethren of Lodge St. George. Brethren, farewell until we meet again in Hyderabad in February next year. I now request our R.W.Assistant Grand Master to address us. Thank you, Brethren. Good morning Companions and welcome to this convocation. I am very pleased to have our M. E. Companion Sir David Hugh Wootton, OBE, Past III Grand Principal of Supreme Grand Chapter of England, with us this morning. He is accompanied by E.Comp.Oliver Lodge, Grand Director of Ceremonies and they are here to celebrate the tercentenary of the United Grand Lodge of England with us. I warmly welcome them and trust that their accommodation and visit thus far, have been comfortable and enjoyable. I would also like to welcome E.Comp. Ramesh Jagtiani, P II G. Pr. P.II R.G.Pr. who is here representing E.Comp. Abraham Markos, the Grand Superintendent of Regional Grand Chapter of Southern India, and his officers. Also with us are E.Comp. V. Nagarajan, Grand Superintendent of District Grand Chapter of Northern India, E.Comp. Dato Jeyaraj Ratnaswamy, the Grand Superintendent of District Grand Chapter of the Eastern Archipalego, E.Comp Pichumani Venkataraman from the District Grand Chapter of Bombay, E.Comp. Joseph Lee from the District Grand Chapter of Hong Kong & Far East, E.Comp. Ferhard Nilgiria, from the District Grand Chapter of Sri Lanka, and E.Comp. P.R. Jackson from the District Grand Chapter of South Island, Newzealand. E.Companions, I welcome all of you to this Convocation and trust that you have been comfortable, and well taken care of since your arrival. Companions, Most E. Comp. Sir David Wootton will be addressing us and I am sure he will inform us of anything relevant from the Supreme Grand Chapter. I will not, therefore, dwell on this subject. Coming to our District I inform you that both administratively and financially the District is in good shape although our membership still remains the same as it has been for the past several years. Only about 50% of our Craft members are Royal Arch Masons and I once again request all of you to make whatever efforts you can to improve our numbers in this beautiful degree. I attended the Installation Convocation of Chapter Excelsior No.1285 on the 9th of June and the records of the Chapter were inspected by E.Comp. Sunil Koliyot. I also attended the Installation Convocation of Chapter Benson No.1093 E.C. on 4th August, 2017. The records of this Chapter were inspected by E.Comp. Narayanan Kutty Nambiar. E.Comp. K. Muralidharan Chapter Cauvery No.3848 on18.03.2017 and Golconda Chapter No.3249 on 31.03.2017. E.Comp. Dr. R. Arunagiri Chapter Rock No.260 on 01.07.2017. I would like to thank them for representing me and for inspecting the records of those Chapters. I request you to please stand and observe a minutes silence in their memory. I would like to record my sincere thanks to E.Comp. Viji Joseph, District Grand Treasurer, E.Comp. S. Ponnaiya, District Grand Scribe Ezra, E.Comp. Sunil Koliyot, District Grand Director of Ceremonies, E.Comp. Sukesh Menon, President Committee of General Purposes and the District Grand Chapter office team for their excellent support for the administration of the District affairs. With these few words I request our ME Comp. Sir David Hugh Wootton to deliver his address to companions, Thank you. Bro. Theo Devagnanam, is the fifth District Ruler since Independence, and by far the youngest to hold this office. Bro Theo Devagnanam was installed the RW DGM of the District Grand Lodge of Madras on 13th August 2011 at Tiruchirapalli. Brethren, let me first welcome all of you to Trichy. The Brethren of Lodge Rock have spared no effort in organising this half yearly meet of the DGL, and I am sure that all of you have been well received and taken care of. I take this opportunity to thank the brethren of Lodge Rock for their kind hospitality. Before I proceed with reporting on the regular news, I must, first, thank the M W the Grand Master, for the confidence that he has reposed in me, in appointing me as the DGM of this district. I thank R.W.Bro. K.R.N. Menon, for having invested me with this high office and can only hope that the GAOTU will give me the wisdom to discharge the duties of that office to the benefit of the whole District. R. W. Bro. K.R.N.Menon, whom I have known, since I was but a lad, has been a close friend of my family, for many years. After the untimely death of my Father, he has been a great source of support and encouragement for me, particularly in Freemasonry. The standards that he has set will not be easy to live up to and I can only hope that I am able to meet them. I must, however, tell you that my administration will not deviate from the excellent administrative policies that R.W.Bro. K.R.N. Menon brought into the District. The policies, of transparency in administration, the recording of all discussions, and the absolute shunning of politics, will continue. The chief objectives of the administration will be the preservation of the principles of masonry, and, as we are told at every installation meet ing, the business of being happy, and communicating happiness. Brethren, I am a third generation Freemason, and our host Lodge, Rock, holds a personal significance for me. It was in this Lodge, in 1922, that my Grandfather, W. Bro. Samuel Devagnanam, was initiated. He went on to become the Master of this Lodge in 1946. After his retirement, from Government service, he settled in The Nilgiris and joined the Lodge of Faith, Hope and Charity, where he installed my Father as W. Master in 1960. My Father, W. Bro. Theo Devagnanam installed me in the same chair in 1985, and I had the pleasure of installing my Son, W. Bro. Theo Devagnanam III, in the same chair, earlier this year. My installation, as DGM, under the banner of this Lodge, is very special to me. I will do everything that I can to support all of you, and our institution, and call upon you for your support, not only in spirit, but also by active involvement in our initiatives. I thank all for having taken the time and the effort to be with us on this occasion. I have also been blessed by the presence of some of my personal friends who have travelled vast distances to be with us this evening. R.W.Bro. H.Y.Wong, PDGM of the DGL of HK and the Far East, I thank you so much for being such a positive influence on my Masonic career. You were present at my first Installation, as W. Master in 1985, you have visited our Lodge since and you were present at the Installation of my Son, Theo, earlier, this year. You have been a close friend of my Family for about forty years, and your presence this evening is of very special significance to me. We also have with us, this evening, W.Bro. Benny Lo, and W.Bro Edward Wen Tai Hey, also from Hong Kong. W. Bro. Benny’s family and mine go back almost 50 years. Benny’s Father In Law and my Father first met, and started to do business together, in 1962. It is wonderful to have you, Benny, with us this evening. I also welcome V.W. Bro. Shegar Balakrishnan who is visiting us from the Irish Province in Singapore. Shegar is also a close friend and is, in fact, related to my wife. Thank you very much for making the effort to be with us. I shall now move on to my report of the Masonic happenings since we last met. The Mentoring Scheme: The mentoring scheme set in motion is designed eventually to mentor members at all stages of their Masonic progress. The aim is to have as many members as possible to act as ambassadors for freemasonry. He drew attention to the working group under the Chairmanship of the Grand Secretary and Provincial and District Grand Masters to ensure that the mentoring messages are consistent. M W the Grand Master also referred to the address by the Head of Disaster Management of the British Red Cross, during the March quarterly communication, and the immediate help rendered by the Grand charity to the affected Districts. At the Investiture meeting, I was promoted to the rank of Past Grand Sword Bearer. Unfortunately, I was not able to attend the meeting. Our Asst. District Grand Master, W.Bro. D P Marshall, who attended the meeting, received the rank of Past Asst. Grand Director of ceremonies. We congratulate him. On July 27, this year our district had the privilege of organising the Prestonian lecture, which was delivered by W Bro. James Campbell. The event was sponsored by The Archibald Campbell Lodge. Wor Bro. Campbell, a member of the Archibald Campbell Lodge, is the Grand son of W.Bro. Archibald Campbell whom the Host lodge is named after. M W the Grand Master of the Grand Lodge of India attended the lecture and the banquet thereafter. Harmony between the brethren of sister constitutions in our District is excellent. R W Bro. K.R.N. Menon, as R W DGM, attended the Universal Brotherhood day celebrations organised by The Regional Grand lodge of Southern India, on 24th June, 2011. He also attended the Half yearly meeting of the Regional Grand Lodge of Southern India at Thanjavur on 6th August, 2011. The mentoring activities of the district are spearheaded by W. Bro. M. S. Duleep, District Grand Mentor, and W. Bro. T. V. Srinivasan, District Grand Orator, who are both giving of a lot of their time and effort towards the success of these activities, and I request every one of you to give them your support and encouragement. W Bro. S Sampath, PAGDC, on his appointment as the Deputy District Grand Master, is succeeded by W Bro. S .Ponnaiya as the District Grand Secretary and we wish both of them success in their new positions. The lease on the Cornwallis Masonic Home has been renewed for a further period of two years. The building is in good repair thanks to our administrator and his team. At the last meeting of the Executive Council of the District Grand Charity, Dr. Srinivasan of the Jeevan Blood Bank and Research centre, made a presentation of the organization, and its activities. It is basically the first public stem cell bank in India. He appealed for financial assistance. Following the meeting, the Trustees decided to donate a sum of Rs.15,00,000/- to this organization. This amount will go towards the collection of further units of cord blood. Charity contributions, towards scholarships, pensions and Medical relief have been dealt with, in detail, in the half yearly report already circulated. It is, however, encouraging to see that the number of Scholarships is now in the region of 145. The goal, of creating a Corpus Fund of Rs. 50 lakhs each for the Masons Welfare Fund and Masonic & Heritage Buildings Trust, is likely to be reached by Novenber, 2011. In an effort to support the Masonic mentoring activities we have created a separate fund for the library. We intend to have the Library fully functional, with all the support material for the mentoring programme, in as short a time as possible. In order to augment the income of the Madras Freemasons Hall Trust, the auditorium will be put to use for various Masonic, and non-Masonic functions. The records, of both Lodges, were inspected by W.Bro. Sukesh Menon. W Bro. S. Sampath- Golconda lodge No.3249 on 18.2.2011. W Bro. A C Patel- Lodge Cauvery No.3848 on 9.7.2011. Very sadly, since we last met, Bro. J.Venugopalan Nair, Master Mason of Lodge Minchin No.2710 was called to the Grand Lodge above on 11th March, 2011. We will stand and observe a minute’s silence in his memory. I would like to place on record the excellent work done by the DGS, W. Bro. S. Sampath, the DGT, W. Bro. N. D. Achiah and the rest of the District Grand Lodge officers who have contributed generously of their time and knowledge in the governing of the District. Thanks, are also due to the staff of the DGL Office, ably led, by Bro. Shanker. Welcome to Trichy. I trust that all of you were well received and are comfortably accommodated. I shall be addressing you at greater length this evening and will, therefore, restrict this address to general news. Before, however, I proceed with reporting on those matters I must first thank the ME The First Grand Principal for having appointed me to the position of Grand Superintendent of this District. I would also like to thank Excellent Companion K.R.N. Menon for having invested me as the Grand Superintendent, and for all the guidance he has given me over the past several years. Excellent Companion Menon, I am sure that I will always continue to review valuable advice and wise counsel from you. Let me also take this opportunity to thank the several visitors who are present this morning and who have taken the trouble to visit us from, not only various parts of the country, but various parts of the world. At the Convocation of the Supreme Grand Chapter in London in April this year the Most Excellent The First Grand Principal, His Royal Highness The Duke of Kent, KG, saw fit to promote me to the rank of Past Grand Sword Bearer. Very unfortunately I was unable to attend the Convocation. The District Grand Chapter continues to be run well both from the administrative and financial points of view. The private Chapters continue to function well and I can only encourage each Chapter to make a concerted effort to increase membership through recruiting of newly made Master Masons into the individual Chapters. Let me welcome all of you to the Annual Investiture Meeting, our first meeting in the Tercentenary year of the Grand Lodge. I trust that the Brethren of Lodge Southern Brotherhood have seen to your accommodation and comfort. I am extremely pleased to welcome R.W.Bro. N.N.Gupta, P Dy GM, P Dy RGM, representative of the Regional Grand Master of the Regional Grand Lodge of Southern India and his delegation. Celebrations to mark the tercentenary of the Grand Lodge actually commenced last year but the greater number of celebrations will take place during the course of this year. The tercentenary was celebrated by our region, in Bombay, on the 27th and 28th of January this year. The meeting was well attended but, more importantly, the District Grand Master’s present had an extremely useful meeting with the Deputy Grand Master. Brethren, the main and the last event in these celebrations is the meeting at Royal Albert Hall on October 31st this year. The meeting will be followed by dinner at the Battersea evolution. For these events the Grand Lodge has allocated our District 18 places at the meeting and 7 places at dinner. There will, however, be a separate dinner at the Connaught Rooms. We have had 27 Brethren express their interest in attending the meeting and the dinner. While all 27 names have been sent to the UGLE we don’t know if we will get any seats in addition to the 18 already allocated to us. We will, therefore, have to choose 18 out of the 27 who will receive the seats allocated to us. I think it is only fair that the first opportunity be given to the Rulers. I would therefore like to allocate two seats to V.W.Bro. Abdul Jifri and W.Bro. D. Rajasekaran. This will leave 16 seats for the remaining 25 applicants. In order to ensure that the selection process is both completely fair and completely transparent it has been decided that the selection will be made by lot. Lots will be drawn for all 25 applicants and their names will be recorded on a document in order of selection. The first 16 names in the list will immediately be allocated the seats that we have for the meeting and first 5 will be allocated the seats that we have for the dinner at the Battersea evolution. The remaining applicants will receive any additional seats that we might get. I am sure Brethren that you will agree that this method is absolutely fair. We will draw the lots soon after we have announced the names of Brethren who have been appointed to the other committees of the District Grand Lodge. Brethren, during the quarterly communication of the Grand Lodge held in December last year Rule No.125 was once again reiterated for the information of Brethren visiting Lodges in other constitutions and for Lodges receiving visitors from other constitutions and I request all of you to please make yourselves completely familiar with the provisions of Rule 125. One of the concerns of the Board of General Purposes, for the last couple of years, has been the use of social media and the Board has now come out with a comprehensive lists of do’s and don’ts when using social media in connection with Freemasonry. The District Grand Lodge office will circulate this document to all Lodges and I request the Lodges in turn to send copies to every member. The Prestonian Lecturer for this year is R.W.Bro. Dr. J.W. Daniel, Past Senior Grand Warden and the title of the Lecture will be, “The Grand Design”. In Grand Lodge the Brethren should wear traditional morning wear together with either one of the two versions of the Craft tie or a plain black tie with no design whether in the weave or not. On all other occasions District, Provincial, or Royal Arch Ties may be worn. Unless it is the custom of a Lodge or District, (such as ours) to meet in evening dress, traditional morning wear or dark lounge suit with black shoes appears to be the appropriate dress. The Board also concluded that the Craft tie may be worn in everyday life. Brethren, I am very pleased to report that our District continues to be in good shape both administratively and financially. As you probably know Freemasonry throughout the world is shrinking, although slowly. The decline in numbers has been a matter of great concern to the Grand Lodge over the last few years and they have done a lot of work towards addressing this matter. We, in the District of Madras are fortunate in that we are not shrinking but, perhaps, growing marginally. While we are still growing it is most important for every Lodge to focus on the needs of its members, particularly the younger members, and find the best way to meet those needs so that we continue to attract young members and that the young members continue to enjoy Freemasonry. The number of members in our District has been a rather steady 1100 and odd over the past few years. 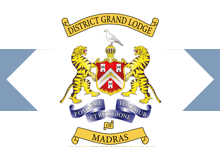 The next half yearly meeting of the District will be held in Chennai on the 10th , 11th and 12th of August 2017 under the banner of Lodge St. George and will be an occasion on which our District celebrates the Tercentenary of Grand Lodge. We will hold a concert of Mozart’s Masonic Music at the Museum Theatre in Chennai and will also bring out a Coffee Table Book on the history of the Freemasonry in Southern India. Brethren neither of these events is going to be cheap and the District will need money to finance them. The Coffee Table Book, which will really be a reference book on the history of Masonry in this part of the world, will be sold at a price of Rs. 2,000/- and I appeal to each one of you to purchase one book in order to help us defray the cost of producing it. I am sure the book would have great value to you and I request each Lodge to please contact every member to ascertain his willingness to purchase a book, collect the money and send it to the DGL Office. As soon as the book is released the required number of copies will be sent to each Lodge. The Tercentenary meeting in our District will be graced by the presence of our Assistant Grand Master R.W.Bro. Sir David Hugh Wootton and others who will accompany him from Grand Lodge. The report of the Executive Council of the District Grand Charity is in your hands and this will give you a clear account of the monies that have been collected and disbursed and the charity work done by your District. The Cornwallis Masonic Home, herein Bangalore, has been leased to the Great Eastern Management Schools Pvt. Ltd. where they are running a college for Hotel Management and Catering. They have completely spruced up the premises and it is not only looking great but is earning us a steady income for our charities. I must, Brethren, at this point, personally congratulate our District Grand Steward for Masonic charities, W.Bro. Praveen Khanna who has out done himself in his efforts to collect for our charities. He has achieved an all time record of collection in excess of Rs. 2 Million for the year. Bro. Praveen Khanna has certainly set new standard for incoming Stewards and I sincerely hope that his successors will be equally dedicated. Those of you who were present at last year’s Investiture Meeting will recall that Bro. Praveen Khanna wasted no time in commencing the discharge of his duties. In fact he started on the very night that he was invested. I think Brethren all of us can learn a lesson from this and I am sure that Bro. Praveen Khanna’s efforts will encourage all of us to take our Masonic duties as seriously as he has done. Brethren apart from my sincere thanks to Bro. Praveen Khanna, I would like also to place on record the very hard work and dedication put in by W.Bro. Selvaraj Ponnaiya, our District Grand Secretary, who has spared no effort to make sure that the District has been administered efficiently. My thanks to our District Grand Treasurer, Wor. Bro. Viji Joseph who has been extremely careful in taking care of the District’s various financial matters including those of the District Grand Charity. I would also like to thank W.Bro. V.J. Bharath, the President of the Board of General Purposes, W.Bro. Sukesh Menon, President of the Executive Council of the District Grand Charity and W.Bro. Sunil Koliyot, our District Grand Director of Ceremonies who have all given of their time and effort in supporting and assisting me in all matters concerning our District and its working. My sincere thanks to our District Grand Mentor W.Bro. M.S. Duleep and our District Grand Orator W.Bro. A.K. Nair who have both been visiting Lodges and working with their members. I would request those Lodges who have not had the benefit of their visits, to please make good use of their willingness to devote time and effort to their responsibilities, as, I am sure each Lodge visited by them will benefit greatly from these visits. A word of thanks is also due to Wor.Bro. P.B. Shankar and his team at the DGL Office for their hard work and co-operation in running our District. I would like to congratulate those of you who have been invested with active and brevet ranks this evening, and would like to reiterate that these ranks have not been given to you in recognition of past services to Masonry but more to encourage you to take on greater responsibilities in the District and contribute more to Freemasonry in the future. I am sure that all of you will make an effort to set an example for the younger Brethren to emulate. Brethren, it is with great happiness that I place on record that two of our Brethren have completed 50 years of service to Masonry during the past year. I presented the citation and lapel pin to W.Bro. Deepak Banker at the regular meeting of the Archibald Campbell on 27th July last year. W.Bro. Deepak Banker, a Past District Junior Grand Deacon was initiated in the Archibald Campbell Lodge on the 23rd of April, 1966. I presented the citation and the lapel pin to W.Bro A.I. Kurian at the regular meeting of Lodge Cochin on the 22nd of October last year. W. Bro. A.I. Kurian, Past Assistant Grand Director of Ceremonies, Past Assistant District Grand Master, was initiated on the 28th of October 1966 in Lodge Cochin. R.W.Bro. K.R.N. Menon, Archibald Campbell on 26th October, 2016. The records of this Lodge were inspected by W.Bro. Sunil Koliyot. V.W.Bro. Abdul Jifri, Lodge Southern Brotherhood on November 28, 2016, Kerala Lodge on 7th January 2017, Lodge Quilon on 14th January 2017 and Lodge Cochin on 21st January 2017. V.W.Bro. S. Sampath, Lodge of Universal Charity on 21st December and St. John’s Lodge on 27th December, 2016. W.Bro.Sukesh Menon, Lodge Ampthill on 21st January 2017. W.Bro.N.Madhuudan, Golconda Lodge on 17th February 2017. I would like to thank them all for representing me and for inspecting the records of the Lodges and reporting back to the District. Brethren, I had the pleasure of attending the Installation meeting of Lodge Anchor of Hope No.1093 on the 8th of February this year and I would like to thank W.Bro. N. Narayanan Kutty for inspecting the records of this Lodge. W.Bro. Dr. M.P. Manomohan, PDJGW of Lodge Minchin on 8th July, 2016. W.Bro. K. Badrinarayanan, Past District Grand Chaplain of Lodge Faith Hope & Charity and Lodge Anchor of Hope on 25th October, 2016. I request you Brethren to rise and observe a moment’s silence in memory of these Brethren. Last but least, I must say a special thanks to Wor.Master and the Brethren of Lodge Southern Brotherhood for the extremely hard work they must have put in to make this such an enjoyable week end for all of us. I thank you all Brethren of Southern Brotherhood and wish you every success in the future. Farewell Brethren, until we meet in August. Most Excellent. Grand Superintendent’s address at the District Grand Chapter meeting on 25.02.2017 - Morning. This is the first Masonic meeting of our District in the Tercentenary year of the UGLE. I trust that the Companions of Chapter Southern Brotherhood and the members of The Lodge of Southern Brotherhood have seen that you are all comfortably accommodated and well provided for. I have great pleasure in welcoming E.Comp. Gopal Rao Prasanna, Past Deputy Grand Registrar, Past Regional Grand Second Principal who is here representing the M.E. Superintendent of the Regional Grand Chapter of Southern India, and his officers. I am also very happy to receive E.Comp. GeneindranSinnathamby, Past Deputy Grand Director of Ceremonies, representative of the M.E.Grand Superintendent of the District Grand Chapter of the Eastern Archipelago. We also have amongst us this morning E.Comp. Shankar LallBannerjee, Deputy Grand Superintendent of the District Grand Chapter of Bengal, who is here representing his Grand Superintendent. It is a pleasure having all of you with us and we sincerely hope that you will enjoy our activities over this week-end. Companions, I would like to once again emphasize the amendments made in the Royal Arch Rules 66A, 66B and 69. I did explain this at our last Convocation and would like to remind you that any Companion who is no longer a subscribing member of a Craft Lodge will automatically cease to be a member of all Royal Arch Chapters, that he is a member of. Statistics recently published by the Supreme Grand Chapter indicate that in the last 11 years about 10% of the working Chapters have closed. Between 2006 and 2015 the number of working Chapters dropped from 3345 to 3040 and this decline in membership is of serious concern to the Supreme Grand Chapter and so should be to us. Coming to our District we continue to have a strength of just under 600 members in Royal Arch Masonry. While this, as a percentage of the number of members of the Craft, is quite reasonable, we still have scope for further growth. I would, once again, urge all our 15 Chapters to appoint Royal Arch representatives in their respective Craft Lodges with the representative’s responsibility being that of educating newly made Master Masons in the importance of the Royal Arch and ultimately recruiting them. Companions, I am pleased to inform you that our District Grand Chapter continues to function efficiently and that our finances are sound. E.Comp. Dr. R. Arunagiri Chapter Rock No.260 on July 2nd, 2016. I would like to thank them for representing me and for inspecting the records of the various Chapters. E.Comp. Dr. M.P. Manomohan, PDG Reg. Chapter Minchin on July 8, 2016. E.Comp. K. Badrinarayanan, PDG ScN, Chapter Excelsior and Chapter Benson on October 25, 2016. Companions, we rise and observe a minute’s silence in their memory. Finally, Companions, I must place on record my sincere thanks to E.Comp. Viji Joseph, District Grand Treasurer, E.Comp. S. Ponnaiya, District Grand Scribe Ezra, E.Comp. Sunil Koliyot, District Grand Director of Ceremonies, E.Comp. Sukesh Menon, President Committee of General Purposes together with E.Comp. P.B. Shanker and his team at the District Grand Chapter office. All of them have given their time and effort in supporting me and seeing that the District has been managed efficiently in terms of administration and finances. I will be addressing you at greater length this evening until then, farewell. Welcome to Calicut and the well known hospitality of Lodge Kerala. I am sure that the Brethren of this 130 year old Lodge have spared no effort to make all of you comfortable in your accommodation and to make you feel at home. Brethren, it is with great pleasure that I welcome our two distinguished visitors this evening, R.W.Bro. K.G. Alexander, Past Junior Grand Warden, Past Deputy Regional Grand Master who represents the R.W. Regional Grand Master, R.W.Bro. Aravind Prasad Chitra, of The Regional Grand Lodge of Southern India and, for the first time, W.Bro.Arvind P. Datar, Past Grand Steward, Asst. Provincial Grand Master, who represents R.W.Bro. Ardeshir Aga, The R.W. Provincial Grand Master of The Provincial Grand Lodge of Ireland in India. Brethren, welcome to Calicut and thank you both very much for being with us over this weekend. I would also like to welcome the officers who have accompanied both of you and I trust that Lodge Kerala is taking good care of all of you. During the Quarterly Communication of the United Grand Lodge of England on 9thMarch, 2016 our M.W.Grand Master, M.W.Bro. His Royal Highness the Duke of Kent was re-elected as Most Worshipful Grand Master for the 49th successive year. Shortly after the installation convocation of the Grand Lodge R.W.Bro. Nigel Brown retired from his post as Grand Secretary. Since then R.W.Bro. Brigadier W.E. Shackell, has been appointed as Grand Secretary of the United Grand Lodge of England. At the Quarterly Communication of the Grand Lodge held on the 8th of June the Masonic Charitable Foundation came into existence. This Charitable Foundation is the result of the amalgamation of the four separate charities that functioned under the Grand Lodge in the past. This change, Brethren, will make it much easier for any District, Private Lodge, or individual Mason to obtain charitable assistance from the Grand Lodge. Brethren, as you all know the UGLE is celebrating 300 years of existence in 2017 and this event will be celebrated in London and in all the Districts around the world. As I have already told you, the main celebration in London will take place on the 31st of October, 2017. The celebration will consist of a formal afternoon meeting at the Royal Albert Hall which will be followed by a formal dinner at the Battersea Evolution. As space at both these venues is limited the Grand Lodge will issue a limited number of tickets to each District depending upon the number of Masons in the District. We now have confirmation from Grand Lodge, that we have been allotted 18 tickets for the meeting at the Royal Albert Hall and 7 tickets for the dinner at Battersea Evolution. I will, in consultation with the other rulers, the Board of General Purposes and the Tercentenary Planning Committee decide the basis upon which these tickets will be allotted to those of you, who have already expressed your intention of attending the celebrations at London. We are also submitting the full list of all those of you who would like to attend the celebrations, to the Grand Lodge, as further tickets may become available through other Districts not taking up their full quota. Brethren, I must also add that I fully intend to attend the celebrations myself and that I will not need one of these tickets to attend. So the full quota of 18 tickets will be available to all of you. Coinciding with the Tercentenary celebrations the Grand Lodge decided to go through a rebranding exercise and have now come up with a new Grand Lodge logo which can be seen on the Grand Lodge website. To mark this event the Grand Lodge has also released a Tercentenary Jewel and a new Grand Lodge Tie. They have also brought out Polo shirts and Golf caps sporting the new logo. All of this merchandise including the jewels is available on the Grand Lodge website. The District Grand Lodge Office will issue a circular on the rules governing the wearing the Tercentenary jewel. Apart from the celebrations in London each region will celebrate the Tercentenary under the banner of one of the Districts in the region. Our District belongs to the Asia Oceanic Region and our regional celebration is to take place in Mumbai from the 26th to 28thJanuary,2017. The special programme of events to be held in Mumbai will be circulated to all Lodges by the DGL Office. Celebrations in our District are scheduled to take place in Chennai from the 9th to the 12th of August, 2017 under the banner of Lodge St. George No.2532. I have appointed R.W.Bro. K.R.N. Menon as Chairman of the Tercentenary celebration planning Committee and asked him to choose the members of his own Committee. This Committee has been meeting regularly and has now decided that we will mark the Tercentenary celebrations with two events one will be a classical music concert featuring Masonic music by Mozart. The other will be the launch of a Coffee Table Book covering 300 years of Freemasonry in Southern India. This, Brethren, will not be just a Coffee Table Book but will also be a reference book on the history of Freemasonry in this part of world. Apart from these two events we are hoping to identify a suitable,deserving, ongoing, charity project which we would like to support in perpetuity. Identifying a worthy project is not that easy but I can assure you that every effort is being made to do so. If our project is really worthy the Grand Lodge will match our funding making it far easier for us to finance it. Further details of our District celebrations will be communicated to you by the DGL Office from time to time. V.W.Bro. Sampath, Past Deputy Grand Master has been appointed as the coordinator between our District, our region, and the UGLE in all matters concerning the Tercentenary celebrations. I am very pleased to inform you that the District is in good shape both administratively and financially. All of our Lodges continue to function well with a couple of hiccups here and there. “I therefore trust that we shall have but one aim in view to please each other and unite in the Grand design of being happy and communicating happiness”. We all have enough trouble and disappointment in our day to day lives. Let us meet briefly, from time to time, as Masons and enjoy those meetings with the happiness that we all ought to share. I would sincerely request members of those Lodges that are experiencing any kind of disharmony to remember these words and work together with your Brethren to resolve whatever issues, or perceived issues there may be from affecting the long term health of your Lodge. Brethren, the credit for the smooth functioning of the District Grand Lodge must go to those who have given of their time and effort to ensure that the administrative and financial affairs of the District are well taken care of and this has being made possible by the dedication and hard work that is being put in by W.Bro. Ponnaiya, our District Grand Secretary, W.Bro.Viji Joseph, our District Grand Treasurer, W.Bro. V.J. Bharath, the President of the Board of General Purposes and W.Bro. SukeshMenon, President of District Grand Charity and W.Bro. Sunil Koliyot, our District Grand Director of Ceremonies. I would be failing in my duty if I do not place on record my appreciation for the work being done by W.Bro. M.S. Duleep, the District Grand Mentor, W.Bro. A.K. Nair, our District Grand Orator who continue to spare no effort to improve Masonic education in the District. My thanks also go out to W.Bro. P.B. Shanker and his staff at the DGL office who, as always, have rendered most dedicated service. Promotion: W.Bro. A.I. Kurian has been promoted to Past Junior Grand Deacon. First Appointments: W.Bro. D. Rajasekaran and W.Bro. Dr. R. Arunagiri both have been appointed Past Assistant Grand Director of Ceremonies. Brethren, please accept my personal congratulations on your appointments and promotion. Brethren I am greatly relieved to inform you that the Cornwallis Masonic Home premises at Bangalore has, at last, got a tenant. After considerable negotiation we have leased the premises to the Great Eastern Management Schools Private Limited who will run a catering and hotel management institution at the premises. The property has been leased at a lease rental of Rs.6 lakhs per month from July 15th, 2016 and will hopefully bring us a steady and long term stream of income for our charities. We have, however, had to spend a sum of approximately Rs.40 lakhs carrying out extensive and major repairs to the building. Apart from what we have spent the tenant is spending far more on landscaping and other construction such as a swimming pool and other, “Temporary”, structures, for the institution. Brethren, I must first thank W.Bro. A.K. Nair through whom we first made contact with the tenant. Following the initial contact W.Bro. Sukesh Menon entered into negotiations with the tenant and was able to bring these to a successful conclusion. My thanks go out to both of them and to W.Bro. R. Srinivasan, District Grand Superintendent of Works who spent a lot of time supervising the repair work that has been done and checking estimates, bills etc. The report of the Executive Council of the District Grand Charity for the period ending 30thJune, 2016 has been circulated to all of you and will give you a clear account of the work of our charities. My thanks also go out to W.Bro. Praveen Khanna, Steward of Masonic Charities who has been I must say, taking his task extremely seriously and who I am sure will complete his year in Office having collected substantial funds for our Charity. R.W.Bro. K.R.N. Menon, PDGM Lodge of Perfect Unanimity No.150 on 08.01.2016.
out by W.Bro. Sunil Koliyot. W.Bro. Dr. M.P. Manomohan, PDJGW, Lodge Minchin on 08.07.2016. Brethren , I request you to stand and observe a minutes silence in their memory. Brethren, once again thanking the visiting deputations from the Regional Grand Lodge of Southern India and from the Provincial Grand Lodge of Ireland in India for their presence and their participation and I request them to join me at the festive board following this meeting. Before I close I would like to, on behalf of all of us, express our gratitude to the Wor. Master and the Brethren of Lodge Kerala who have left no stone unturned in ensuring our comforts and our enjoyment of these celebrations. Good morning. Welcome to Calicut and thank you all for being here to attend this Convocation. I am sure that the Kerala Lodge and Chapter have gone out of their way to make sure that all of you are comfortable. Our congratulations are due to theKerala Chapter on their having just completed, on August 10, 2016, 60 years of Royal Arch Masonry. I take this opportunity to wish the principals and companions of the Chapter the very best in the years ahead. This morning we have with us E.Comp. Dr. K.G. Alexander, Past President Committee of General Purposes, Past.II. Regional Grand Principal and the representative of The Grand Superintendent E.Comp. Aravind Prasad Chitra, of the Regional Grand Chapter of Southern India and his officers and I welcome them. I would also like to welcome Very Ex. Comp. K. Chandramohan, District Grand Inspector for South and the representative of Most Excellent Comp. Rajiv Dave the M.E. District Grand King of the District Grand Holy Royal Arch Chapter of Ireland in India, and his officers. Not that he really requires a welcome being a member of the Kerala Chapter. Hitherto if a member of both the Craft and the Royal Arch was to resign from his membership of the Craft he could continue to be a member of a Chapter. These amendments now prohibit that and with effect from 31st December 2016 a person can be a member of the Chapter only if he is a subscribing member of a Craft Lodge under the United Grand Lodge of England or a recognized Grand Lodge. If a member of any Chapter resigns from membership of all the Craft Lodges he belongs to, his membership in the Chapter automatically ceases. Companions, I am not reading the entire rule and amendment, and I request the principals and the scribes of each Chapter to please remember this to read the amended regulations in detail so that they may know what has to be done in every case, particularly when it comes to joining or rejoining members. If, of course, you have any doubt please feel free to write to the District Grand Chapter office for a clarification. I am pleased to report that all the 15 Chapters in our District continue to do well and our Royal Arch membership remains about the same at approximately 600members. Companions, as I have said before I once again request each of our 15 Chapters to appoint a Royal Arch representative in the Craft Lodge that it is attached to. The task of the Royal Arch representative is to educate the members of the Craft Lodge on Royal Arch Masonry and provide them with sufficient information to get them interested in joining the Royal Arch. There is still scope for us to increase our Royal Arch strength and I sincerely hope that this will happen in the next couple of years. Companions, at the Annual Investiture Convocation of the Supreme Grand Chapter in April this year E.Comp. D. Rajasekaran and E.Comp. Dr. R. Arunagiri were both honoured with the rank of Past Asst Grand Director of Ceremonies. E.Comp. Dr. M.P. Manomohan, PDG Regr, of Chapter Minchin No.2710 on 8.7.2016. I shall be addressing you at greater length this evening and would therefore like to close with my sincere thanks to E.Comp. Viji Joseph, District Grand Treasurer, E.Comp. S. Ponnaiya, District Grand Scribe Ezra, E.Comp. Sukesh Menon, President District Committee of General Purposes, E.Comp. Sunil Koliyot, District Grand Director of Ceremonies and the District Grand Chapter office team for their excellent support and hard work in administering the affairs of the District. It is, as always, a pleasure to be with all of you and more so under the generous hospitality of the largest Lodge in our District, Lodge Minchin. Lodge Minchin was scheduled to host the August 2015 Half Yearly meet but we had to ask them to postpone it to February 2016 in view of the Regional Conference of District Grand Masters which had to be held in Chennai, last February. Brethren, I extend a very very warm welcome to R.W. Bro. Retnaraj Sushilraj, OSM, Past Dy. Grand Master, Past Regional Grand Master and the representative of R W Regional Grand Master, of the Regional Grand Lodge of Southern India, and his officers. At a recent communication of the Grand Lodge the Board of General Purposes stressed the need for accurate maintenance of the Lodge Meeting minutes, as covered by Rule 144 of the Book of Constitutions. The Board reiterated the need for Lodges to record the proceedings at meetings meticulously to make sure that they were properly preserved. The District Grand Lodge Office will send out a circular on this subject, in greater detail. Together with this they will circulate a few amendments recently made to the Book of Constitutions. As we approach the tercentenary of the UGLE, next year, plans for our own celebrations are taking shape. While the celebration in London will be at the end of October 2017, the celebrations in our region will take place in Bombay at the end of February 2017, and the celebrations for our District will take place in Chennai during the half yearly meet of the DGL in 2017. I formed a committee, ably headed by R.W.Bro. K.R.N. Menon, to plan and execute the celebrations within our District. V.W.Bro. S. Sampath has been appointed as a co-ordinator between our District and the UGLE to ensure that they are kept fully aware of what we plan to do. We have just received further information on the celebrations that are planned in London. There will be a Tercentenary Ceremony at the Royal Albert Hall in London followed by a formal dinner at Battersea Evolution, on October 31st, 2017. The timing has not been finalised but the meeting is likely to start mid afternoon with the formal dinner at 7.00 p.m. The number of people who will be able to attend the formal ceremony is limited by space. We have now received information that the Provinces and Districts will be allotted one place for every 70 members. This will mean that our District will get 15 places. I am sure that many of you would like to be a part of this very special celebration but, unfortunately, the number of us who can attend is severely restricted by space. I request all those who would be interested in attending the ceremony in London to immediately apply to the District Grand Secretary informing him of your intention. We will then determine criteria by which we can select those who will be given the 15 places that we have. It would be advantageous to us if all those attending could travel together as a group as this is likely to reduce the total cost of travelling. The Grand Lodge is looking into various other dining options. They are considering lunch at the Royal Albert Hall before the ceremony or dinner at Royal Albert Hall after the ceremony. They have sent us a list of questions to which they would like answers as soon as possible. The questions relate to the travel and dining preferences of those who will be attending the ceremony. As these questions can be answered only by those attending we need to immediately determine who those people are so that we can respond to Grand Lodge. Your applications are therefore requested without delay. As some of you are probably aware in the run up to the tercentenary the Grand Lodge has reviewed its image and branding. To this end they have modified the logo of the square and compasses. The new logo can be seen on the Grand Lodge website. They have ordered that with effect from 25th June 2016 this logo is to replace the old square and compasses logo on all printed forms / stationary, summonses etc. in all Provinces, Districts and private Lodges. The DGL office will send out a circular on this subject. Brethren, the last time we met I had to speak of the increasing number of disciplinary cases that we are facing and in this context I mentioned that there was one Lodge in our District which seemed to be heading for trouble. Unfortunately my warning was either, too late or, went unheeded, as a result of which the Lodge is in trouble. Unfortunately, these problems have resulted in disharmony among the members of the Lodge, and a lot of mud slinging. I visited the Lodge and spent an hour and a half talking with the Brethren but this does not seem to have had much effect. The troubles, created by the members, continue and the very sad part about the whole affair, Brethren, is that the Senior members are, to the best of my knowledge, doing nothing. I, once again, appeal to the members if the Lodge to put your differences aside and work with that love and harmony which will ensure the survival of your Lodge. I congratulate those to whom I have given first ranks this evening and those who have received promotions. Please remember, brethren, that these ranks and promotions are not given for what you have done, but are meant to encourage you to greater involvement in the future and I look for ward to that involvement from all of you. The District Grand Lodge continues to be in good shape both administratively and financially. The Office continues to work efficiently and the administrators amongst our ranks have given their time and effort to make sure we are on an even keel. Our very special thanks must go out to W.Bro. Ponnaiya, our District Grand Secretary, W.Bro. Viji Joseph, our District Grand Treasurer, W.Bro. Sunil Koliyot, our District Grand Director of Ceremonies, W.Bro. V.J. Bharath , President of the Board and W.Bro. Sukesh Menon, President of the Charity. Our District Grand Mentor W.Bro. Duleep and our District Grand Orator W.Bro. A.K. Nair continue to spread Masonic education through the District. The unprecedented flooding in Chennai and the Districts South, as we all know caused considerable hardship for many many thousands of people. The loss of life and property will never be accurately stated. Brethren, as soon as disaster struck, W.Bro. Sukesh Menon sent out an appeal for funds to assist those badly affected. The Executive Council of the District Grand Charity has met frequently ever since. An early decision was made committing whatever funds we could collect to reequipping homes for the elderly, orphanages and homes for the destitute and differently abled, with equipment that had been destroyed by the flood and which they did not have the capital to replace. The Executive Council of the Charity, ably assisted by a group of volunteers, spent an enormous amount of their own time, and money, in travelling the length and breadth of the city, visiting institutions that had been affected, verifying the loss of equipment and then sourcing and replacing it. All of this was done with the utmost involvement, dedication and efficiency and I would like to personally congratulate W.Bro. Sukesh and his team for the tremendous task that they undertook and accomplished. I would like to place on record my personal thanks and that of the Brethren of our District, to each of you who have made it possible for us to live up to our obligation towards charity. Brethren, I must, from the bottom of my heart, express my gratitude to all of you for the speedy and generous manner in which you responded to our appeal for funds thereby making this whole effort possible. I would like to place on record our very grateful thanks to the District Grand Lodge of Eastern Archipelago which spontaneously sent us a contribution of Rupees one million. Likewise, our grateful thanks to Grand Lodge who responded to our appeal and immediately gave us a grant for a further One million Rupees. These contributions, put together with your own generous contribution amounted to a total collection of approximately Rs.5 million out of which over Rs.3 million has already been disbursed and gratefully received. The report of the Executive Council of the District Grand Charity for the period ending December 31, 2015 is in your hands and gives you a clear account of the work done. I would also like to thank our Steward of Charities W.Bro. Dr. George Jeyaprakash for his earnest efforts in collecting funds. The Cornwallis Masonic Home continues to be unoccupied but is well maintained. Since we last met I have had the pleasure of attending the installation of Lodge Ampthill No. 3682 on January 23, 2016. The records of the Lodge were inspected by W.Bro. Sunil Koliyot. My thanks are due to the following Brethren who, very kindly, represented me at the installations of other Lodges. I would like to thank W.Bro Sunil Koliyot for inspecting the records of Lodge Archibald Campbell and Lodge Perfect Unanimity, and W.Bro. K.M. Sukumaran for inspecting the records of Lodge of Universal Charity. Brethren, please be upstanding to observe a minutes silence in their memory. I would like to once again thank our visitors from the Regional Grand Lodge of Southern India for their participation in our meetings and I invite them to join me at the festive board following the meeting. Brethren, our gratitude, once more to the W.Master and the Brethren of Lodge Minchin for all the work they put in to ensure that we have been well looked after during the events of this weekend. Till we meet in Calicut in August, Brethren, good luck and God speed. Good morning Companions and a warm welcome to Trivandrum. It is as always a pleasure to be together again and I am sure that the members of Lodge Minchin and its Chapter have you all comfortably accommodated and well looked after. It is a great pleasure to have with us this morning M.E.Comp.Retnaraj Sushilraj, P.II.Grand Principal & Immediate Past Grand Superintendent, who is representing The Grand Superintendent of the Regional Grand Chapter of Southern India, and his officers. I extend to them a warm welcome. Over the last year or so, concerns have been expressed in the Supreme Grand Chapter that a significant number of Brethren, who are no longer subscribing members of a Craft Lodge, continue their membership in the Royal Arch. In future no candidate is to be exalted in to the Royal Arch or admitted as a joining or rejoining member of any Chapter, unless he is a subscribing member of a Craft Lodge under the UGLE or any recognized Grand Lodge. That on and from December 31, 2016, any companion who has had any time been a subscribing member of a Lodge under the UGLE, and thereafter ceases to be a subscribing member, unless he is an Honorary member, or unless he is a subscribing member of a Lodge under a recognized Grand Lodge, will have a period of grace within which to join or rejoin a Lodge under the UGLE, at the end of which if he fails to do so, his membership of his Royal Arch Chapter will be automatically terminated. I request the Scribe Ezra of each of our Chapters to please take note of this and to advise any Chapter member who is not a subscribing member of a Craft Lodge of this resolution passed by the Supreme Grand Chapter. The District Grand Scribe Ezra’s office will issue a circular on this matter. The District Grand Chapter continues to function well and I am pleased to see that our Chapter membership continues to remain reasonably steady and represents a healthy percentage of our Craft membership. Efforts, however, can still be made to increase Royal Arch membership further and I once again strongly recommend that each Chapter appoints a Chapter representative in its respective Craft Lodge whose responsibility shall be to introduce Royal Arch Masonry to every member of the Craft. E.Comp. I. Varkey, PDG ScN, who was exalted on February 20th, 1965 in Chapter Kinta No.3212, under the District Grand Chapter of the Eastern Archipelago who is currently a member of Chapter Universal Charity No. 273, and E.Comp. A.C. Patel, PAG Sojr, P DIII Gr Pr. Who was exalted on August 13, 1965 in Chapter Universal Charity No. 273 EC. I had the pleasure of presenting the citations and lapel pins to these companions at the Golden Jubilee Convocation of Chapter Universal Charity on the 5th of November, 2015. I attended the installation convocation of Chapter Benson No.1093 on August 1, 2015 and the records of the Chapter were inspected by E.Comp. Sunil Koliyot. Companions, it is with grief that I inform you of the passing away of E.Comp. Dr. N. Sukumaran, PDG Pr Sojr, of Chapter Quilon No.5839 on the 10th of December last year. I request all of you to please stand and observe a minutes silence in his memory. My sincere thanks to E.Comp. Viji Joseph , District Grand Treasurer, E.Comp. S. Ponnaiya, District Grand Scribe Ezra, E.Comp. Sukesh Menon, President – District Committee of General Purposes, E.Comp. Sunil Koliyot, District Grand Director of Ceremonies and the team at the District Grand Chapter office for the support that they have given me in the administration of the District Grand Chapter. Companions, I will address you at greater length this evening. It is a pleasure to be meeting at our District Head Quarters, once again, and I would like to welcome all of you to the same venue at which we met in February. We have the John Miller Lodge to thank for the arrangements they have made to look after all of us on this occasion. In fact a special thanks is due to them for having taken on this task, at short notice, in view of the Regional Conference of District Grand Masters, which was held yesterday. They have done remarkably well in the short time given to them. I must also say a word of thanks to Lodge Minchin who have agreed to organise the 2016 Annual Investiture meeting in Trivandrum instead of this one. Brethren we have many distinguished visitors with us this evening and I would like to first welcome R.W.Bro. Nigel Brown, Grand Secretary and Past Junior Grand Warden, who is here representing the Grand Master and Grand Lodge. Accompanying him, also from London, is W.Bro. Lister Park, who gave us a very interesting and useful presentation yesterday afternoon. For those of you who would like to know a little more about him and his job I suggest you read an article on him in the latest Freemasonry Today. It is a great pleasure to have with us this evening R.W.Bro. T.R. Mohanakrishnan, Past Dy. Grand Master, Dy. Regional Grand Master, representative of the R.W. Regional Grand Master of the Regional Grand Lodge of Southern India, and his officers. I also take great pleasure in welcoming to our midst R.W.Bro. Malin Goonetileke, RW District Grand Master of the District Grand Lodge of Srilanka, R.W.Bro. Datuk. Dr. Yeoh Poh Hong, RW District Grand Master of Dist. Grand Lodge of The Eastern Archipelago, R.W.Bro. David A Fok, Past DGM and representative of the R.W. District Grand Master of the District Grand Lodge of Hong Kong and the Far East, RW Bro. Percy Driver, the RW District Grand Master of Dist Grand Lodge of Bombay, and R.W.Bro. V. Nagarajan, the R.W. District Grand Master of District Grand Lodge of Northern India, who have all travelled considerable distances to be with us on this occasion. I sincerely hope that all of you have been looked after well and that you found yesterday’s conference useful. Brethren, I would like to draw your attention to the report, of the Board of General Purposes, presented at the quarterly communication of Grand Lodge held on March 11, 2015. In this report the Board has expressed its concern at the increase in the number of disciplinary cases that are brought before those Masonic authorities charged with the duty of dealing with such matters. The report reminds us, Brethren, of the founding principles of brotherly love, relief and truth and the need for all Freemasons to maintain the highest standards of behavior both in public and private life. Together with these principles comes the notion of tolerance which naturally requires a respect for others. Regrettably, brethren, during the last few months we have been compelled to take rather drastic disciplinary action against Lodges and individual brethren, which every Lodge has been advised of. Let me assure you Brethren that this action was not taken lightly or without sufficient cause. The action was taken following several unfortunate incidents in the same Lodge which led to a complaint being made against Brethren for violating the Constitutional rules. The matter was duly enquired into, under the provisions of the Book of Constitutions, and the brethren involved did not deny their actions and made it very clear that they have absolutely no regret or remorse over having violated the rules. This culminated in a letter of admonition being issued to the Lodge and four brethren being suspended from all Masonic activity. Brethren all of this stems from one Brother, or a group of brethren, pursuing grievances, or perceived grievances, against another brother or group of brethren. It is unfortunate that such grievances have been pursued in such a single minded manner that all sense of proportion has been lost and the actions of certain Brethren have become unreasonable. It is my sincere hope that action we have been compelled to take will have a positive effect on all of you and will urge you to drop a tear of sympathy over the failings of a brother, and strive to work with the brotherhood, harmony, and unanimity that should distinguish us at all times. I must, sadly, inform all of you that another case of similar complexion is rearing its ugly head in another of our Lodges and I can only appeal to the Brethren of that Lodge to respect the founding principles of Freemasonry, pull their Lodge back from impending disaster and make every effort to sort out, peaceably and amicably whatever differences, or perceived differences that the Brethren might have between them. Apart from the foregoing, I am pleased to inform you that the District Grand Lodge continues to be in good shape both administratively and financially. This has been made possible by all those who have been actively involved in the administration of the District and have unstintingly given of their time and effort towards keeping us on an even keel. My very special thanks to W.Bro. S. Ponnaiya, District Grand Secretary, W.Bro. Viji Joseph, District Grand Treasurer, W.Bro. Sunil Koliyot, District Grand Director of Ceremonies, W.Bro. V.J. Bharath, President of the Board of General Purposes and W.Bro. Sukesh Menon, President of the District Grand Charity. The Regional District Grand Masters conferences are to be an annual event and will be held in the Districts of each region, in rotation. The first conference for our region was held in Kuala Lumpur in December 2013 and the second in Hong Kong in October 2014. The next conference is to be held in Chennai, organised by our District in August this year. The conference is scheduled in two sessions with the morning session being restricted to District Grand Masters and the Brethren who represent the Grand Lodge. The afternoon session is thrown open to all Master Masons and will be addressed by all District Grand Masters who are all attending, who will make presentations of their Districts, charitable activities, etc. This session will prove most interesting for many Master Masons and will also give you all an opportunity to meet and fraternize with your Brethren from the various Districts in our region. I trust that you will attend this session in large numbers. I would also like to place on record my appreciation for the services and advice given to us by W.Bro. Raja Kalifulla, District Grand Registrar, W.Bro. P.S. Raman both of whom have been of great help in guiding me on the very difficult disciplinary matters that I have had to deal with. The report of the Executive Council of the District Grand Charity has been circulated to all of you and it gives you a clear account of the work of our Charity. A special thanks to our Steward of Charities W.Bro. George Jayaprakash who has been able to rise over half a million Rupees. The Cornwallis Masonic Home in Bangalore is, regrettably, still unoccupied and is now in need of certain repairs which will be undertaken. Every effort is being made to find a tenant. I acknowledge with thanks the work done by W.Bro. M.S. Duleep, the District Grand Mentor and W.Bro. A.K. Nair, our District Grand Orator both of whom have made considerable contributions to the advancement of Masonic education in our District. I had the pleasure of listening to W.Bro. M.S. Duleep, in my Mother Lodge and I must say I was most impressed. I am sure that many of you have benefited from his programmes. W.Bro. Sukesh Menon kindly inspected the records of Lodge Ampthill and W.Bro. Sunil Koliyot of Lodge Anchor of Hope and Lodge of Faith Hope & Charity. W.Bro. Sukesh Menon very kindly inspected the records of Lodge Kerala and the Lodge of Perfect Unanimity. I would like to thank these Brethren for having represented me at these various meetings. Brethren I request you to please stand and observe a minutes silence in their memory. Before I close I would like to place on record the excellent work put in by W.Bro. P.B. Shanker, Assistant District Grand Secretary and his team at the DGL office who continue to keep our affairs in order. Before I close thanks once again to our distinguished visitors whose company we have greatly enjoyed and finally Brethren a very very warm word of thanks to the Wor.Master and the Brethren of the John Miller Lodge who, we all know have worked very hard in organizing this week-end of Masonic activity. I am sure that our host Lodge John Miller and its Chapter have you all comfortably accommodated and well looked after. I must say that they have done an excellent job given the short time that they had. We have with us this morning several distinguished visitors and it is my pleasure to welcome E.Comp. Nigel Brown, Grand Scribe Ezra, of the Supreme Grand Chapter of England, accompanied by Comp. Lister Park. I am also pleased to welcome M.E.Comp. T.R. Mohanakrishnan, P.II. Grand Principal & II R.G.Pr, the representative of The Grand Superintendent of Regional Grand Chapter of Southern India, and his officers. It is a pleasure to welcome my fellow Grand Superintendents from the neighbouring districts in our region, E.Comp. Malin Goonetileke, The Grand Superintendent of District Grand Chapter of Srilanka, E. Comp. Datuk. Dr. Yeoh Poh Hong, The Grand Superintendent of District Grand Chapter of The Eastern Archipelago, E.Comp. David A Fok, Past Grand Superintendent and representative of The Grand Superintendent of the District Grand Chapter of Hong Kong and the Far East, E.Comp. Percy Driver, The Grand Superintendent of District Grand Chapter of Bombay, and E.Comp. V. Nagarajan, The Grand Superintendent of District Grand Chapter of Northern India, and their officers. The Grand Chapter recently made a contribution of about one million pounds towards restoring the Willis Organ in Grand Lodge. Companions, I can tell you that the money has been well spent because the organ now sounds wonderful. I had the pleasure of hearing it at the recent Annual Investiture meeting in London. It might interest you to know that, until recently, Henry Willis the IVth whose Father built the organ in Grand Lodge, was a member of our District. He was a member of The Lodge of Faith Hope & Charity and Chapter Excelsior. Unfortunately age related health problems forced him to resign last year. I am pleased to report that all 15 Chapters in our District are working well and I can only repeat that with just under 600 Chapter members, there is still scope to increase our numbers. I would appeal to all Chapters to please work with their respective Craft Lodges to ensure that our Chapter membership increases. The amendments to the Bye-Laws of the District Grand Chapter which have been brought to this meeting are being made in order to keep in line with the Supreme Grand Chapter. I had the pleasure of attending Installation Convocation of Chapter Excelsior No.1285 on the 12th of June and the records of the Chapter were inspected by E.Comp. George Jeyaprakash. I was also able to attend the Installation Convocation of Chapter Benson No. 1093 on August 1. The records of books were inspected by E.Comp. Sunil Koliyot. I would like to thank these Companions personally for having represented me and for having inspected the records of the various Chapters. E.Comp. C.N. Vennel, PDG ScN, Chapter Ampthill No.3682 on January 18, 2015 and E.Comp. A.P. Mhetras, PDDyGD of C, Pitt Macdonald Chapter No.1198 on February 17, 2015. I request you all to stand and observe a minutes silence in their memory. My very sincere thanks go to E.Comp. Viji Joseph, District Grand Treasurer, E.Comp. S. Ponnaiya, District Grand Scribe Ezra, E.Comp. Sukesh Menon, The President Committee of General Purposes, and E.Comp. Sunil Koliyot, District Grand Director of Ceremonies, Comp. P.B. Shankar and his team at the District Office for the great amount of time and effort they have put in keeping the affairs of the District Grand Chapter in order. Companions, I shall address you at greater length this evening. Let me first wish you all a very happy, healthy, and successful 2015. The past year has been a masonically active and interesting year for many of us and I trust that 2015 will be as good or better. As you know the United Grand Lodge of England celebrates the landmark of its tercentenary in the year 2017. Plans are now underway for celebrations to mark this event throughout the world. Over the last few years English Masonic Districts in various parts of the world have come together to form regions. We belong to the Asia Oceanic region which is comprised of the four English Districts in India, the District of Sri Lanka, the District of Eastern Archipelago, the District of Hong Kong and Far East, the District of New Zealand – South Island, the District of New Zealand – North Island, and the Grand Inspectorate in Fiji. Plans are underway worldwide for regional celebrations of the tercentenary in the year 2017. Naturally, individual Districts will organise their own celebrations. All these events will take place at various times in 2017 culminating in a grand celebration in London on October 31, 2017. The event in London is going to be held at the Royal Albert Hall followed by dinner. This meeting, however, will be restricted to only 5,000 people which will be Masons and their ladies. The UGLE plans to stream this event live to various parts of the world, and to the various Temples at Grand Lodge on Great Queen street. In October I attended the Regional District Grand Masters Conference which was held in Hong Kong and coincided with the installation of a new District Grand Master in Hong Kong. The event was well attended. The Pro Grand Master, the Grand Secretary, the Grand Director of Ceremonies and the Deputy Grand Director of Ceremonies were present for the installation. The Pro Grand Master and the Grand Secretary attended the District Grand Masters conference at which the main subject of discussion was the tercentenary celebration. Grand Lodge was requested to inform each District of the number of people who may attend the tercentenary celebrations in London. As soon as this information becomes available the District Grand Lodge Office will circulate it to all Lodges and those who wish to attend are requested to submit their names to the District Grand Secretary as soon as the information becomes available. I trust that several of you, from our District would like to attend this event and I sincerely hope that we will have a large contingent. The regional celebration is scheduled to take place towards the end of February 2017 in Bombay. The District Grand Lodge officers from the various Districts in our region are appointing representatives to coordinate in the organization of this truly important event and we are looking forward to a great celebration in Bombay. Once again, as soon as space and other constraints are known the District Grand Lodge Office will keep you all informed of the availability of seats at this celebration. Our District is planning our tercentenary celebrations at the time of the Annual Investiture meeting in February 2017 which is to be held in Bangalore. A Committee to organize this event is being formed under the chairmanship of R.W.Bro. K.R.N. Menon and you will all be kept informed as more information becomes available. The next two years is going to be busy organizing these various events and I appeal to all our members for their support in whatever manner they are called upon to assist the organising committees in making sure that the celebrations are greatly enjoyed. Brethren, I look forward to meeting many of you in Chennai next month and I, once again, wish you the very best for 2015. Today we come to the end of another year and I sincerely hope that all of you have had a successful year. The year 2012 brought the Olympic Games to London once again. To mark this occasion, the Grand Stewards, at the Grand Festival in April this year, brought out a small publication which, apart from other information, had some very interesting facts connecting Freemasonry to the Modern Olympic Games which I think would be of interest to the great majority of Freemasons. The Olympic Games of 1908 was due to be held in Rome but a violent eruption of Mount Vesuvius in 1906, caused so much disruption that the Italian government was in no position to host the games in 1908. The international committee asked Lord Desborough (Past Junior Grand Warden), who had won a silver medal for fencing at the games in Athens in 1896, if he considered it possible for the 1908 games to be held on London. The British Olympic Council decided that they would accept the invitation to host the games with Lord Desborough, an outstanding sportsman, as President. The London Olympics in 1908 was put together in two years, a truly amazing achievement. This was achieved through the remarkable ability of Imre Kiralfy who was a well-known showman in Britain. He took on the challenge of constructing the required buildings, swimming tank, tracks and dressing rooms and the stadium at Shepherd’s Bush in ten months. Imre Kiralfy was initiated into the Scottish Constitution in 1868 and a Founder Member of Empress Lodge London in 1895. He was appointed a Grand Officer in 1899 and promoted to Past Junior Grand Deacon in 1908. He was also prominent in other Orders in Freemasonry. On Monday 13thJuly 1908 the Games were opened by His Majesty Kind Edward VII (Past Grand Master). Sir Arthur Conan Doyle was a medical officer at the Games and was a member of the Phoenix Lodge No.257. In 1924 Harold Abrahams won a gold medal in the 100 Meters and a silver medal in the 200 Meters. He was a member of the Oxford and Cambridge University Lodge No.1118 and the Athlon Lodge No.4674. Four years later he was appointed as Team Captain of the British Olympic Team in the 1928 Games in Amsterdam. The winner of the bronze medal in that 100 Meters race was Lord Porritt who joined the Apollo University Lodge No.357 and had a very distinguished career as a Freemason, being Junior Grand Warden in 1964 and being awarded the Order of Service to Masonry in 1981. He was a leading surgeon before becoming Governor General of New Zealand. The founders of the Athlon Lodge No.4674, which was consecrated in 1925, were leading members of the Amateur Athletic Association and included Harold Whitlock who won the 50 km Walk in the 1936 Berlin Games. Sir Arthur Gold was a prominent Athletic Administrator during this period and a member of two London Lodges and Athlon Chapter No.4674. He was responsible for persuading the British Olympic Association to permanently ban drug cheats from the Olympic team. The 1944 Games, which had been awarded to London, were cancelled due to the war. In 1946 the Lord Mayor of London, Sir George Aylwen Bt. , Past Junior Grand Warden, submitted a formal application to hold the 1948 Games, once again, putting the Games together in just two years. The London Organising Committee had Arthur Porritt as one of its members. Another member was Jack Beresford – an outstanding Oarsman and a member of the Argonauts Lodge No.2243. He won a total of three gold and two silver medals at five successive Olympic Games between 1920 and 1936. Also on the Committee was Ernest Holt Director of Organisation for the Games who was Treasurer of the Athlon Lodge from1945 – 1952. Jack Crump an initiate of Athlon Lodge was British Team Manager for these Games. The Games were inaugurated in July 1948 by His Majesty King George VI (Past Grand Master). In more recent years there have been a number of Freemasons who have been outstanding competitors across a wide range of disciplines. Robin Bourne-Taylor of Apollo University Lodge No. 357 won three Boat Races with Oxford and two World Championship bronze medals and competed in both the 2004 and the 2008 Games. In the 2012 Games James Ellington, a member of Spencer Park Lodge was a member of the British Olympic Relay Squad. Spencer Park Lodge has had several high profile international athletes as its members over the years. Although, in our own District, we don’t know of Freemasons who have participated in the Olympic Games we do have many outstanding athletes and sportspersons. Two of them in, the field of athletics are, Wor.Bro. Maj. R.K. Singh of St. John’s Lodge No. 434 and.the Golconda Lodge No3249 who is, even today, an international athlete. He represented India in the year 2009 participating the 15th Asian Athletic meet in Thailand and the recently concluded international open Athletics in Colombo, Sri Lanka. Wor. Bro. Maj. R.K. Singh is truly an outstanding veteran athlete. At present he represents India and Andra Pradesh in the Sprint Double and in the Relays. He has been acclaimed the fastest athlete, in his age group, in Andra Pradesh for the past three years. Wr.Bro. V.R. Kirshnan Nair, who is 87 years old, and a member of Lodge Minchin No. 2710, won the second place in the 800 Meters, representing India in the Seventeenth Asia Masters Athletic Championships in Taiwan in November this year. I am sure we have several other outstanding sportsmen in our fraternity. It is, to a certain extent, natural for sportsmen to be drawn to Freemasonry as the guiding spirit for both sports and Freemasonry is about the same. It is not about winning but about participating with enthusiasm, honour and fairness. Brethren, I would like to wish all of you a very happy, peaceful, and prosperous 2013. In about six weeks time we shall meet in Thanjavur and I trust that we will have a large gathering. The Brethren of Lodge Cauvery are working extremely hard towards the success of our Half Yearly meeting and I am sure that their hospitality will be greatly appreciated. In recent times we have observed that in some cases, the Secretaries of Lodges have not been adequately trained or briefed to enable them to perform their duties efficiently. The time for a training programme is ripe. Accordingly the DGL Office have planned a brief, but comprehensive training programme for Secretaries in Thanjavur on the morning of Friday August 10. I request all Lodges to please make sure that your Secretary is present at that meeting. It will be of great help to the Secretary and, of course, to the Lodge. It would also benefit the Lodges, and the Secretaries if the ruling Master was also present. During the second half of the year and the first quarter of next year we have a large number of installations through out our District and in view of this it is hoped that incoming Secretaries (wherever known) would also greatly benefit from this programme. Our Mentoring programme having made some progress, does not appear to be moving as quickly as we would like. In an effort to stimulate the programme we will, once again, have the Mentors meeting on August 10. I sincerely hope that the private Lodges are making good use of this website and comments or suggestions, if any, are most welcome. These may please be addressed to the District Grand Secretary. It is with immense pleasure that I would like to officially launch the revamped website of the District Grand Lodge of Madras. The revamped site has several new features and also carries a complete directory of all members of the District. It has been provided with, “Members Access”, feature to enable sharing the information between members. All Returns of the District Grand Lodge are being made available to enable electronic filing of the Returns. The website will also endeavour to keep an updated list of reading material available in our Library. The DGL Office will post all messages, DGL Reports etc. on the website so that Brethren all over the District will have continuous access to this information. I request all members of District to please visit the website regularly and to please feel free to send us any constructive criticism as they will enable the District to continuously improve in its efforts to fully embrace the age of electronic communication.